Mohamed Salah scored twice to equal Roger Hunt's club record for goals before the turn of the year as Liverpool came from behind to beat Leicester 2-1. The Egypt international took his tally to 23 for the campaign, with 17 in the league, with a second-half double to draw level with the mark set by Hunt in 1961-62. Liverpool had been trailing to an early goal for Jamie Vardy, who set a Leicester record of his own by becoming the first Foxes player to score in five successive matches against the Reds. "Credit where credit is due. 2 more goals. 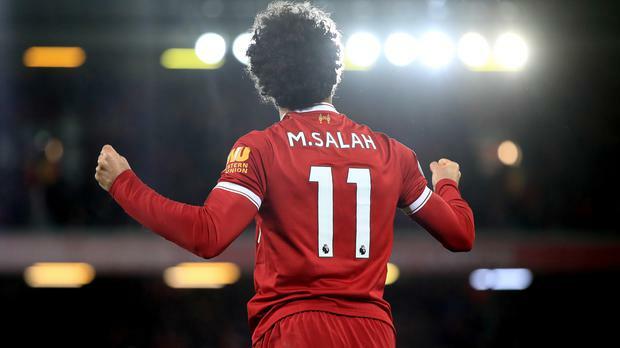 Salah you little b*****d."
Stole the show yet again. Salah failed to make the most of some decent opportunities in this match, but the quality he can produce in front of goal and has done throughout the season to date was very much in evidence with his brace that turned the contest around. Jurgen Klopp's side bounced back after being punished early on for an error at the back. Joel Matip's misplaced pass was seized upon by Vicente Iborra and the Spaniard played the ball wide to Riyad Mahrez, who teed up a simple finish for Vardy. Certainly it would have been interesting to know what the incoming Virgil van Dijk, Matip's fellow centre-back who Liverpool are making the world's most expensive defender, made of it as he watched on from the stands. This was Leicester boss Claude Puel's first loss against Liverpool in seven meetings. Prior to this he had faced the Merseyside outfit four times as Southampton manager and twice while in charge at Lyon, winning three of those games. Loris Karius 6 (out of 10), Joe Gomez 6, Joel Matip 5, Dejan Lovren 6, Andrew Robertson 6, Emre Can 6, James Milner 6, Sadio Mane 6, Mohamed Salah 8, Philippe Coutinho 7, Roberto Firmino 7. Substitutes: Alex Oxlade-Chamberlain (for Mane, 72 mins) 6, Georginio Wijnaldum (for Salah, 83) 6, Ragnar Klavan (for Coutinho, 89) 6. Kasper Schmeichel 6, Daniel Amartey 6, Harry Maguire 7, Wes Morgan 7, Christian Fuchs 6, Riyad Mahrez 6, Vicente Iborra 6, Wilfred Ndidi 7, Marc Albrighton 6, Demarai Gray 6, Jamie Vardy 7. Subs: Islam Slimani (for Vardy, 74) 5, Shinji Okazaki (for Mahrez, 73) 5, Matty James (for Albrighton, 83) 5.